Not only are these chic Lela Rose for Payless Mapleton Printed T-Strap Wedges a must-have item for your closet, these are actually on sale this week. Lela Rose knows how to design a feminine look and of course this is naturally extended to her stylish footwear. 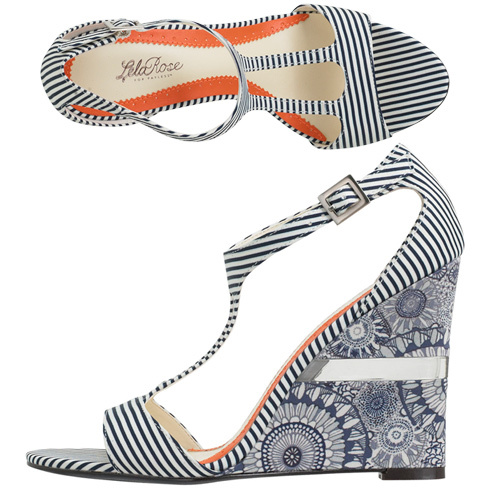 This Navy and Cream Mapleton Printed T-Strap wedge features a sleek satin stripe print on the upper, trendy t-strap shape with cut-outs, adjustable ankle strap, lightly padded footbed for comfort, and a 4" satin-wrapped architectural floral printed heel which also features a see-through detail. Easter weekend means Easter Sales, these are normally $54.99 but they can be yours now for $44.99. They won't last long so you should grab these while you still have time.